Gastronomica Makan was first published in Fillip 16 in Spring 2012. This is a conversation between two core members of Makan, an art space and collective founded in 2003 in Amman, Jordan. Makan is presently experimenting with becoming a nomadic and conceptual project that attempts to break free of its original physical boundaries. 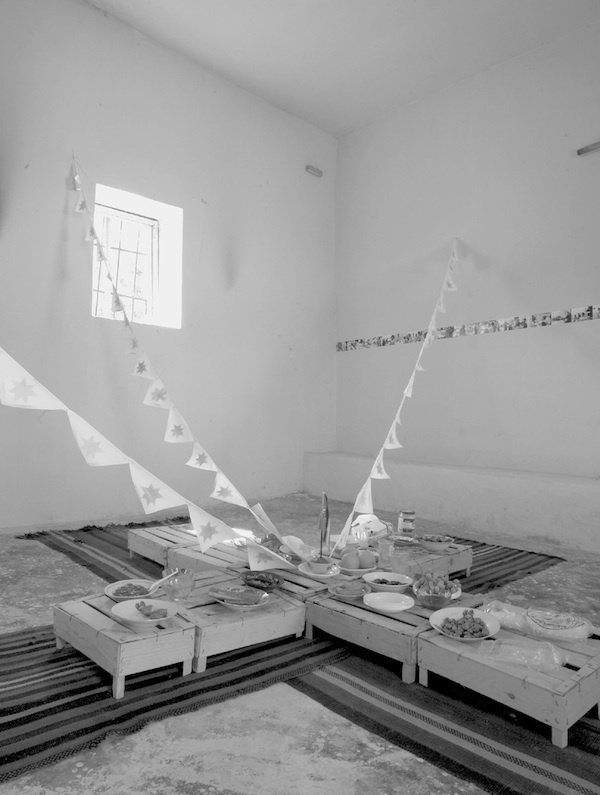 This conversation came out of our  continuous questioning of its meaning, role, identity, future, and survival—all in relation to Makan’s existence vis-à-vis its specific, initial site and the tireless efforts of the group to continue the project while living within different geographic contexts, presently Amman and San Francisco. As a conversation, it does not attempt to come up with answers to problems regarding how and why we do what we do, but rather to produce a narrative or analysis of the possibilities inherent in our activities and contexts. One way for us to learn how to proceed with such a discussion is to try and understand who we are. The most comfortable space to do this is the kitchen. This discussion unfolded while cooking and eating, activities that emphasize points of commonality among members of the collective. All recipes in this text are provided for the reader to try. They are real recipes composed with a slice of imagination. In a deep pan, heat some olive oil, then add onions, garlic, chili, and a dash of salt. Stir until the onion is soft, then add tomatoes and cook well. In a different pan, stir-fry the okra with a bit of sugar (this will help the okra keep its fresh green colour) and a dash of salt. When soft, add to the onion and tomato mixture and cook until you see some of the okra just begin to split. If served hot, eat with white rice; if cold, eat with bread. If you have the opportunity on the day before serving the meal, marinate the steak in a little red wine and soy sauce, and add a sprinkle of freshly crushed black pepper. Grill in a really hot pan, first on one side then on the other. Cook according to taste. Prepare the table with placemats, plates, forks, and knives. Put food for the cat in her bowl. Then enjoy your meal. A salad of tossed greens would not hurt. Ola El-Khalidi: We have conversations about Makan almost every day either face to face or via email with Samah,  and with other artists and friends, or in classes. But when it comes to writing about Makan, I feel scared of facing its issues, wanting them to be in our heads only. At the same time, sharing our chaos and confusion with the outside world could create a document that archives our thinking processes regarding how we approach the project at this point in time. Since we are in San Francisco at the moment, do you think Makan is an illusion or just an intangible project to which we are attached? Are these conversations that we have about the definition and future of Makan repetitive? I worry that we are not taking these conversations beyond the exercise of the conversation itself, to the next level. Is there anything new coming out of them? What worries you about Makan? Diala Khasawnih: On one level, of course, Makan is a construct, an invention. You invented it by opening the door to it and now we are all dreaming it, making it out of thin air, exactly like the concept behind the title of our publication An Idea in a Void. The void here describes the context in which Makan came into being and continues to exist. In the absence of a local foundation in Amman to support a contemporary art scene, and the critics, writers, schools, and spaces necessary to have one, there is a sense of spontaneity and urgency to Makan, which is shaped by all these missing things. This particular situation helps us to develop Makan and there is a lot of hard work to be done. Is Makan an illusion? It is similar to asking whether being an artist is an illusion or a real career. What defines a real art space anyhow? There are many definitions that Makan meets and many that it does not. Makan is real if only because it involves so many people who believe it exists and who allow it to exist. In fact, there is a team that invests a lot of time and energy into it. Plus, Makan has budgets, salaries, bills, and a Facebook page with friends. I am attached to Makan. It is beautiful. It is an attitude, a political act, and a piece of theatre. Makan has taken on a variety of identities over time. It is a centre of sorts, manifesting in a physical space and activities, as well as in a residency space and event program. It is a group of Makanis, individuals in Amman and around the globe, who have at some point worked in the space and continue to be associated with it. It is also a travelling entity that responds to the core group’s movement. I suppose our conversations about Makan are repetitive, but every once in a while something new comes up as a revelation or an idea. I am sure of it. Some of the conversations reflect our confusion, but by analyzing our experiences, we are imagining next steps. OK: There is a legitimate space for fear in what we do because we operate Makan in Jordan, within restricting and unpredictable conditions there, both politically and legally. This includes the ambiguity and shifting laws legislating a space like Makan, difficulties in obtaining travel visas or simply moving within the region, not to mention state control and censorship, which prohibit relevant discourse. Makan’s organizational structure and context are surreal. Technically, we were set up as a not-for-profit company supporting the arts, registered under the Ministry of Industry and Trade , which is subject to new laws that can change from day to night within the current political and juridical climate of Jordan. These chaotic and bureaucratic systems are not exclusively negative in effect, however, because they at least help us to create new modes of operation for artistic spaces and discourses. We are by now highly experienced in creating the right conditions to work and survive. The one thing I fear is losing our motivation, but I am optimistic—specifically now with the uprisings happening in our region as well as all other forms of fundamental change. Our role should be to keep doing what we do. Drain and pour the fava beans into a deep pan. Mix in some salt, then heat. When hot, smash into a rough paste. In a separate dish, crush many garlic cloves, add finely chopped green chilies, and squeeze in the juice of a couple of lemons. Combine well with olive oil and salt. Put the warm fava paste into a bowl, add the garlic and lemon mixture on top and garnish with fresh parsley leaves. Best eaten with fresh pita bread. Be sure to scoop up the fava paste with a generous share of the garlic and lemon mixture. Drink hot tea with fresh mint leaves and sugar for maximum deliciousness. Very good as a weekend brunch; allow time for a decent siesta afterwards. OK: If we think of Makan as a concept or a multi-layered project, then yes. We are still in the process of realizing what this notion of Makan as a concept actually means. We are constantly interrogating and redefining what Makan is. And to me, this is the only way Makan can survive—by continuing to question the meaning of its existence. Makan started in Amman out of a necessity to create a space that gathers people who share an interest in contemporary art practices, and was meant to be a laboratory for experimentation. I found myself back in Amman in 2002. My interactions with the city were limited then. I had moved there with my family in 1990 from Kuwait City, the city of my birth, where we were, in fact, forced out. Like many Palestinians and Jordanians (and whatever combination of the two), my family and I were not allowed to stay in Kuwait. Back then, my only worry was the loss of friends as I had no means of finding them. Facebook was not yet an option. I got over my loneliness soon enough, however, when I realized that I was now living in a city that offered me much more freedom than Kuwait had. But in Amman, I was still trying to find my space, my people. I believed that art was a promising tool to present notions outside social norms, ideas dismissed or swept under the carpet because there was no space for them to exist. I wanted to find a way for myself in the city through art, which I imagined offered an open space where everything is allowed, including crazy people with crazy ideas. I had no plan and little money, but I had good friends and a supportive family, artists ready to boogie, a thirsty audience, a city ready for new voices, and, of course, a good lawyer. I opened the space in the spring of 2003. All I had was excitement and energy for the potential and possibilities that awaited. Artists were curious about the space and what it could offer; some helped with the renovation, some started volunteering during exhibition openings and film screenings. Artist Samah Hijawi rented the first studio and Ala Diab took over the other studio in exchange for design work. Oraib Toukan constructed the first installation work in Makan. Alma Khasawnih ended up inhabiting my empty office, and with these new neighbours, I was no longer alone. After a year, we were building something of an art scene: talking about art and life; hosting music performances; making and showing works; inviting speakers; and screening films weekly. The space had a balcony and it hosted what seems today like an eight-year-long conversation with so many cups of tea and cigarettes. Makan became known for presenting something vibrant and different. While tracing Makan’s origins is important, do you have a different version of the story? This is all based on my memory, and memory, as we know and experience it, is subject to change. DK: My story with Makan began many years ago at the house of Ahmad Khalidi, a dear friend and a visual artist and designer. We had been meeting regularly to work on a Web site we created to act as a reference for Jordanian arts and artists. One afternoon, Ahmad told me that his cousin, Ola, was thinking of starting a space, a cultural centre of sorts, something contemporary that might be focused on music. I went to Beirut so we never launched our Web site, but I clearly remember his mention of what is now Makan. Then a couple of years later, in 2004, while I was living in Beirut, my friend Ala Diab (a former classmate of mine from architecture school and, as you have already mentioned, he once was Makan’s in-house graphic designer) was in town for an electronic music workshop. We agreed to meet in my flat in Mar Mkhayel, at the time a desolate neighbourhood at the edge of town, now a booming destination. Ala invited you along. We had fun, I remember, drinking beer and smoking on the small balcony. Then when I went to Amman, the first thing I did was come check out your space—Makan. The tour around the place naturally ended with tea on the balcony. I felt the space was very familiar. It made sense, as if it were a manifestation of a space that had been in my imagination for a long time. I felt like I had just made a huge discovery and I was excited. This excitement was not unrelated to my excitement in meeting you. You and Makan will always be connected. Eventually, the existence of Makan made my decision to leave Beirut, after living there for a little over two years, relatively easier. OK: So, how did your relationship with Makan start? As a member of its audience, or as an artist, or as a member of its team? DK: My relationship with Makan started with meeting you. My sister, Alma, was already involved in the space. So, I quickly became an audience member. There was a moment when Makan offered memberships, and I still have one of the beautifully designed membership cards somewhere. During those early days, I also showed a couple of my paintings as part of a group exhibition. In 2005, I participated in Meeting Points  with a work entitled DYNA in collaboration with Hanan Khalil. This was my first experience in making work outside of my painting practice and I found myself in the middle of an action, busy preparing Makan for an event, and in the process transforming spaces with the help of technicians, labourers, and friends at work. This was a turning point in my work as an artist as I did not study art; I had studied architecture, the closest thing to art available. My introduction to the possibilities of contemporary art and education really started when I walked into Makan. I used to say: “Art is the Answer.” Now I do not like answers anymore, so I no longer have a saying, but, since my involvement with Makan, I have indeed been able to explore many aspects of contemporary art practices. My relationship with Makan is active and dynamic; it is professional, romantic, familial, and, of course, about friendship. Over time, I have taken on many roles in Makan, which acts as a rooting agent, offering me a foundation, a sense of association, and responsibility. OK: I do not want to be an artist. I cannot be one. Ola is the mulukhyyeh expert in San Francisco. Although it can only be found frozen here, it still makes for a brilliant dish of green, slimy, soup-like stew—especially when one is homesick and has had enough training since childhood to stomach the stuff. OK: We are now in San Francisco. How does this impact your role in Makan? Even though we are far away, don’t you feel Makan is with us? From here, are we still serving as an alternative space for the support of contemporary arts in Jordan and the region? DK: It will take time, I guess, to get my head around our move. When I introduce myself I say I am a visual artist and a member of an art space in Amman, Jordan, called Makan. I need to rephrase that, fix it: “Hello! I am a visual artist and a member of an art project called Makan.” Sometimes, I call it a collective. I feel that by placing myself at such a distance from the space, I suggest a departure from it, being outside of it, as if I were on sabbatical, which is not true. It is inaccurate since I am still involved and since, indeed, Makan is with us here in San Francisco. Now, being so far away from the actual space, my relationship to Makan is being reshaped; it is taking a much more independent and self-initiated role—one that has no fixed framework but rather a dynamic context. With this shifting geography, can we still be “an alternative space for the support of contemporary arts in Jordan and the region”? Maybe we can take out some words and add others: “We are an alternative entity for the support of contemporary arts, with a particular interest in Jordan and the regions around it.” So, this could, as you said, take many forms—publications, virtual projects, and in the style of our new context, a series of pop-up eateries. But, in the big picture, our own growth should pour into the support of arts in Jordan, no? When one of our colleagues decided to leave Makan, he told me that one of his reasons was that “Makan is a utopian place, what happens in there is not real,” and this scared him. What do you think he meant by that? DK: I am not sure what he meant. What comes to my mind is that after a dictatorial education, if one finds oneself working in a happy place, a place of relative freedom and choice, one is terrified. Unless work is difficult (as in a struggle) then something is wrong. There is a lot of space in Makan, it is very much a collective, democratic sort of structure, where one’s role shifts and compliments and negotiates in relation to others’ and with what is happening. Also, Makan relies on self-direction. This can be challenging for many. Is Makan utopian? In a sense, it has the possibility of utopianism. Makan is an ongoing invention. We do not have concrete objectives and absolute agendas, and this allows for a sense of an uncertain future and endless possibilities. We do care about the work involved in running Makan, which includes a lot of space for dreaming, love, joy, travel, friendship, and food. For me, it is a struggle to do what I do, being an artist. There is always one existential question or another in the background, which sometimes comes to the foreground, but I have made my decision about what I do already and I am confident about it. I think people generally like to be busy, productive, and making things, but many forces have been working really hard for a very long time to make sure that the factories continue to run. People get trained, shaped, and produced in order to join the work force, leaving little space to question what it is they do, leaving little space for dreaming and philosophizing. People are easier to control like that. Tell me, why is the physical space so prominent, why is Makan, the project, so tied to its location at #21 Nadim Al-Mallah Street, Jabal Al-Weibdeh, Amman, Jordan? OK: It is concrete. What we do at Makan is generate experiences. You enter the space and one of Makan’s members welcomes you. You find the balcony and you drink tea. You run into a local artist who you know or a visiting artist who you are meeting for the first time. There is a library. There is always a chance of viewing a new installation or intervention in the space. It is domineering because it’s where things get cooked, or if you like, where things get valued. It is a theatre or a stage rather. There is a consistency and a familiarity in what its physical space offers. DK: We continue to talk about funding, how to get it and what it means. I am tired of fundraising. I also think it is unhealthy. It is political and tyrannical. So, as you know, I feel we should create a money-generating project (or projects) that sustains Makan, the space, and the programs. But, if we make Makan financially independent, would we then become successful business people? OK: I don’t see an exclusive connection between the two. Makan could be an independent project by simply not having anyone dependent upon it. Do you mean that we would become capitalists? Let’s say we start a café—Makan Café—and it makes profit and the profit feeds into Makan. I don’t see it as a business. We could be successful philanthropists, if you want. I am thinking along the lines of creating multiple projects that would generate profit at the same time. DK: Will we still have time for art? I don’t think we have thought about this extensively enough. We have had conversations about how we want to come up with these projects and we know we are interested in food. It is time for a serious plan. DK: I am ready for a serious plan—objectives, deadlines, an experiment, results, and more food. Yes, rather than go back and forth wondering, let us imagine our next step. For example: we make labaneh with Widad in Shatana and sell it worldwide. We run a gallery. We run a café. OK: We participated in the Congress of Collectives  with the project LBC-Makan Restaurant addressing sustainability in the arts, which is one of our main concerns. The event took place in October 2011 and there was tension between us every time we sat and talked about the business plan and the shareholder agreement. It was a struggle. I feel we are losing our sense of humour in regards to how we are approaching Makan. It is as if Makan grew older and can’t joke around anymore. There is a sense of naivety that I miss. I would like to remind you that I am at school right now where inhibitions are multiplying by the second. For Makan’s eighth birthday, to which friends and family were invited, Shereen Najjar  created an aubergine-themed banquet. Although a controversial vegetable inspiring extreme opinions, aubergine has always been a main ingredient at our table. Aubergine fatteh is so good that it may (as is said in Arabic) drive one to eat one’s own fingers after tasting it. For a garnish have ready chopped parsley leaves and maybe something red, like a chili. Slice aubergines into sections. Rub with olive oil, and place in a hot oven. Turn once. When they are tender, remove from oven. Cut pita bread in small squares and bake until crunchy. Mix crushed garlic and salt into plain yogurt. This dish is made of layers. In a large pan, place the aubergine layer, follow with a layer of the crunchy bread, then cover with a layer of the yogurt mixture. Garnish and serve before the bread goes soft. For an extra rich fatteh, add a layer of minced meat that has been stir-fried in olive oil with finely chopped onions, add a dash of black pepper and salt, and garnish with fried pine nuts and almonds. DK: Let’s not lose our sense of humour. Are we a collective or are we Makan’s rotating administration? OK: Our core collective (Diala, Samah, and Ola) came to being out of what seemed like a natural progression: we got together at the right time recognizing a common urge to work in a group. We compliment and support one another. Maybe our interests and needs in regards to how we can survive are changing or will change in the future. The administration is only an aspect of what we do; we are possibly rotating it. There is no contradiction to the collective sense here. DK: Samah is in Amman now, and we have plans to go back and forth. Although we will always be missing the foundation, the thick concrete that binds us to the geography of Amman, we will be lighter, possibly faster, and more mobile if we are not so rooted. Nomadic Makan. Our difficulties regarding geography and roots may be related, after all, to our histories in the fact that we are not nationalists and that we are all to some degree refugees. There is displacement in our personal histories as well as a continuous search for a spot to belong in a city that forces a sense of temporariness on its people, as well as a sense of increased alienation in a changing social landscape. There is no single place that offers us all we want or need from a place, and this is why Makan can be our makan, our place. Or is this why Makan, like us, is forced into a life of searching? Shall we embrace our search and consider ourselves travellers, adventurers, wanderers? Back to an earlier thought, can Makan be an alternative space for the support of contemporary art in Jordan if we are not in Jordan? I think this is a real issue. It is politically critical to work “for” the region from outside the region, especially from the United States of America. Will Makan have the same significance if it is anywhere other than Amman? Is Makan always bound to Amman? OK: Part of Makan’s team is here in San Francisco, so naturally the team is not at present physically tied to Amman, but I think we should take this conversation in a different direction. Instead of questioning whether Makan is related to a physical space, we need to study how we are operating Makan outside of Amman. It is already happening. We are doing it. Our next publication series should be called Makan and Elsewhere. DK: How about Demakan the Makan? I would like to work on a book entitled Gastronomica Makan. 1 potato, 1 tomato, 1 carrot, 1 onion, and 1 chili. Chop everything into small pieces. In a deep pan, heat a bit of olive oil, add onions and a dash of salt. Stir until soft. Add the chili mix, then all the vegetables and a bit of salt. Mix all together and then add the lentils, stirring in a lot of cumin powder. Quickly add a lot of water, about 6 cups. When it boils, reduce the heat. Cook according to taste: the soup can be served thick or watery, and can even be blended together a little—but not too much. Just before serving, turn off heat and stir in some fresh parsley leaves. Serve hot. Once ladled into individual bowls, squeeze some lemon into each serving. ↩ 1. The “group” here refers to Ola El-Khalidi, Diala Khasawnih, and Samah Hijawi, sometimes referred to as Makan’s collective. ↩ 2. If living in the Mission district of San Francisco, get fresh okra from the Civic Center farmers’ market or the Duc Loi Supermarket (2200 Mission Street). Otherwise, plant your own. ↩ 3. Samah Hijawi is an artist and a member of Makan, presently running the space and program in Amman, Jordan. ↩ 4. In September 2009, Ola and Diala took Makan to a residency called Quien puede vivir en esta casa run by artist Lucrecia Urbano in Buenos Aires. They spent three weeks at the residency during which, in response to great demand, they invited a crowd to a Levantine meal. Alongside the meal, they produced a cookbook for future residents including the recipes made that day and where to find required ingredients in Buenos Aires. The menu comprised lentil soup, chicken fatteh, okra in olive oil, aubergine with tahini, and hummus. The residency also included a dance class conducted by Ola. See http://makanhouse.net/content/makan-cooks-argentina. ↩ 5. On April 1, 2011, Makan was invited to cook ful as part of the event “April’s Ful” responding to the Arab Spring. The event was part of the Oakland Museum of California’s Oakland Standard series, organized by the Citizen’s Laboratory. See http://museumca.org/theoaklandstandard/april-fuls-night. ↩ 6. Saddam Hussein, the ruler of Iraq at the time, invaded Kuwait on August 2, 1990. As a result of the Palestine Liberation Organization’s (PLO) position in support of Saddam Hussein’s invasion, an estimated 450,000 Palestinians were expelled from Kuwait. ↩ 7. Meeting Points started in 2003 and is organized by the Young Arab Theater Fund. It has become an international multidisciplinary event that comprises visual arts, film, theatre, dance, music, and performance. Its sixth edition runs from April 2011 to March 2012. Makan has been a partner since its inception. ↩ 8. Labaneh’S-Cool is a work made for the show Home? that featured Jeanno Gaussi (a member of Shatana Workshop 2009) along with Ola and Diala. It was curated by Deirdre Visser as part of the arts program at the California Institute of Integral Studies, and ran September–November, 2011. ↩ 9. As a variation on the dish, Diala’s Damascene grandmother used whole leaves of mulukhyyeh. She got them fresh, semi-fried the leaves whole, and then kept them in the freezer. In a bowl, place in layers: 1. fried or grilled (as long as crunchy) little squares of pita bread; 2. white rice (with tiny vermicelli mixed into it); 3. the whole leaf mulukhyyeh stew; 4. the chicken; 5. a spoonful of finely chopped onion soaked in white vinegar. Best eaten with small bites of green chili. For more on mulukhyyeh, see http://en.wikipedia.org/wiki/Corchorus. Y la caricia volverá a ti Es verano. El sol asoma a las 5 a.m. en el pequeño y montañoso pueblo de Shatana. Hace calor y las ventanas están abiertas. El viento sacude las cortinas y una luz intensa baña la blanca habitación que comparto con Mohamed (Marruecos), Bashar (Palestina) y Mustafa (Jordania). Tengo con migo las anteojeras que la azafata repartió en el avión. Las uso para aprovechar un rato más de sueño. Sé que de 8 a 10 a.m. puedo disfrutar del desayuno. En Shatana Workshop no hay horarios, no hay obligaciones externas. Lo que haces lo haces porque quieres y lo consideras necesario. Sólo las comidas tienen horarios y la primera por supuesto es el desayuno. Las comidas, el tiempo del alimento, son un gran momento de intercambio entre la veintena de artistas que compartimos esta corta e intensa residencia de quince días. Las comidas en Shatana Workshop son la manifestación del espíritu que la organización proyecta sobre el grupo. Hay en las comidas una caricia, algo suave, algo que nos predispone de modo particular a ese intercambio. No importa cuánto calor hace, no importa cuán duro estés trabajando, no importa si tu proyecto marcha como quisieras o no. Tres veces al día esa caricia volverá a ti en Shatana Workshop. ↩ 11. Tom Bogaert, when asked to describe a meal in Makan, wrote: In the Spring of 2010, I did a 98 day residency at Makan. Part of the deal was to cook for the Makanese people and while I’m not a natural born cook, I promised Diala (my Makan guardian angel) to give it my best. Life was busy as always, amongst other things with painting Jordanian flags on fresh cucumbers and baking meringues made with washing powder bought in the West Bank settlement of Ariel; all very useful and relevant artistic cooking activities but alas no time for preparing real food for real people as promised. I started feeling a bit guilty and in order to buy some time, I decided to go for takeaway from a well known restaurant in Downtown Amman. You have to know; Makan is situated on a hill overlooking Downtown and there are no easy solutions in getting to the restaurant: walking? the heat! driving? the traffic! flying? no wings! Once again Diala saved my day and said: “Take your bag and walk to the nearby multi-storey parking lot, take the elevator to the ground floor level (12 floors down), walk through the men’s suit souk, don’t look the salespersons in the eye, cross the street, be careful, enter the restaurant, show them this note, order the food and bring it back up to Makan by elevator.” That’s what I did and one hour later we had a fantastic lunch on Makan’s terrace—it was one of the best meals I had in my entire life. I kept the post-it as a souvenir; I’ve used it many times since. I wasn’t off the hook though. About two weeks later I cooked spaghetti con calamari and we talked about fish and Gaza—but that’s another story. ↩ 14. Organized by Flux Factory in New York City in October 2011, this event brought together collectives from cities across the globe to get to know one another, talk about collectiveness, and realize projects. Parts of the event included the public. Makan’s project created a pilot restaurant called LBC-Makan Restaurant (LBC: Lentils Beyond Control) in which other participating collectives bought shares. However, the business plan proved to be unfeasible so Makan ventured on its own. ↩ 15. Shereen Najjar is a long time friend of Samah’s, a graphic designer and passionate cook. Image: Makan Space, Amman, Jordan, 2009. Courtesy of Ola El-Khalidi. Along with Samah Hijawi, Khalidi and Khasawnih are members of the collective Makan, an independent contemporary art space based in Amman, Jordan. Founded in 2003 by Khalidi, Makan encourages experimentation in concepts and production. Among its projects are an artist exchange and residency program, local and international workshops, exhibitions, performances, and screenings often with a lot of food involved. Khasawnih is an artist and translator frequently experimenting with yet another recipe for okra stew. Khalidi is an independent curator who received an MA in Curatorial Practice from the California College of the Arts in San Francisco in 2012.